While granite, limestone, and other types of natural stone are completely opaque, onyx, alabaster, and marble are translucent. When back-lighting is used on panels fabricated from these stones, their ability to transmit light gives them a luminous appearance. Illumination also reveals the subtle details of the complex patterning found in these extraordinary stones. 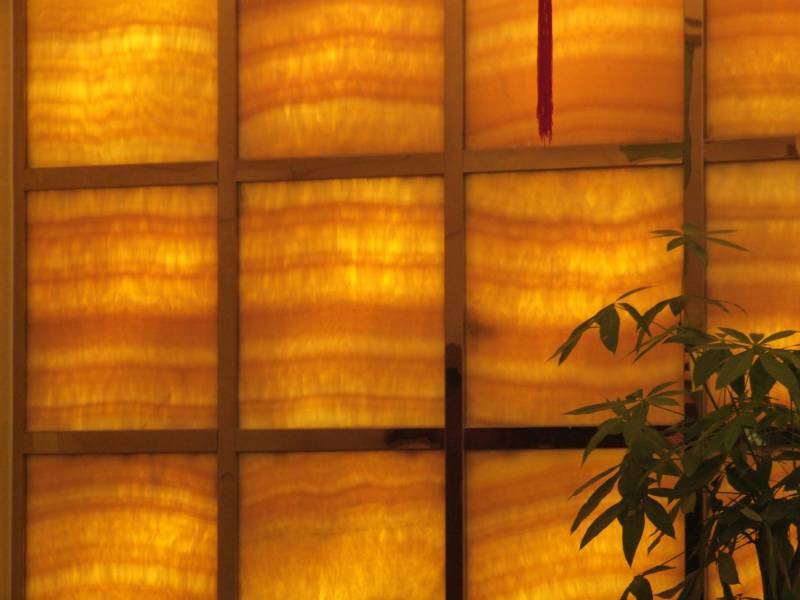 Translucent stone panels by StonePly are suitable for many applications, and back-lighting ensures they will be brilliant and radiant focal points regardless of where they are placed. *Have a variety in mind that you don’t see featured on our site? Let us know! We can source natural onyx, marble, and alabaster from within the United States as well as from international locations such as South Africa, China, and Spain. We will do our best to locate the exact pattern and shade you desire for your illuminated natural stone bar top, feature wall, or floor. Lightweight and shatter-resistant translucent stone panels are created by bonding a thin layer of light-emitting stone to glass or polycarbonate using epoxy. The pieces of translucent stone are slid into U-shaped channels. Finally, all joints are sealed. The attachment system will not create any unsightly shadows and dark areas behind individual panels, and provides adequate room for the addition of back-lighting. To find out more about our StonePly Translucent option that can be used to add drama and elegance to retail settings, hospitality businesses, high-end resorts, and more, visit us online at the StonePly website. Interested in discussing the details of your project with us and finding out roughly how much it will cost? We are happy to provide an initial consultation and a personalized estimate at no charge. You can get in touch with us by phone at 903-454-4630. If you prefer, you can also complete the short form on our site’s contact page.